Practice Cyber Security questions and answers for interviews, campus placements, online tests, aptitude tests, quizzes and competitive exams. This set of Cyber Security Multiple Choice Questions & Answers (MCQs) focuses on “Types of Cryptography – 1”. 1. _________________ is the process or mechanism used for converting ordinary plain text into garbled non-human readable text & vice-versa. Explanation: Cryptography is the process or mechanism used for converting ordinary plain text into garbled non-human readable text & vice-versa. It is a means of storing & transmitting information in a specific format so that only those for whom it is planned can understand or process it. 2. ______________ is a means of storing & transmitting information in a specific format so that only those for whom it is planned can understand or process it. Explanation: Cryptography is a means of storing & transmitting information in a specific format so that only those for whom it is planned can understand or process it where “kryptos” means secret, “graphein” means to-write. Explanation: Cryptography helps in securing information in a specific format so that only intended users can understand or process it. When plain text is converted to the unreadable format, that type of text is termed as cipher-text. 4. Cryptographic algorithms are based on mathematical algorithms where these algorithms use ___________ for a secure transformation of data. Explanation: When plain text is converted to unreadable format through some algorithms, that type of text is termed as cipher text. Cryptographic algorithms are based on mathematical algorithms where these algorithms use the secret key for a secure transformation of data. 5. Cryptography can be divided into ______ types. Explanation: Cryptography can be divided into two types. These are classic cryptography & modern cryptography. Using these techniques, users can secure their information from illegitimate ones. Explanation: The means of storing or sending data in a specific format so that only intended users can process it is called cryptography. Data which is easily readable & understandable without any special algorithm or method is called plain text. Explanation: Data which is easily readable & understandable without any special algorithm or method is called plain text or clear-text. This text is not secured and can be readable by anyone who is not even a legitimate user. 8. There are ________ types of cryptographic techniques used in general. Explanation: There are three types of cryptographic techniques used in general. These are Symmetric Key cryptography, public key cryptography, and Hash functions based cryptography. 9. Conventional cryptography is also known as _____________ or symmetric-key encryption. Explanation: The various cryptographic techniques are symmetric Key cryptography, public key cryptography, and Hash functions based cryptography. Conventional cryptography is also known as secret-key cryptography or symmetric-key encryption. 10. Data Encryption Standard is an example of a _____________ cryptosystem. Explanation: Conventional cryptography is also known as secret-key cryptography or symmetric-key encryption. Data Encryption Standard is an example of a conventional cryptosystem. 11. _______________ cryptography deals with traditional characters, i.e., letters & digits directly. Explanation: Cryptography can be divided into two types. These are classic cryptography & modern cryptography. Classic cryptography deals with traditional characters, i.e., letters & digits directly. 12. ____________ cryptography operates on binary-bit series and strings. Explanation: Cryptography can be divided into two types. These are classic cryptography & modern cryptography. Modern cryptography operates on binary-bit series and strings. 13. __________ cryptography has always been focussing on the concept of ‘security through obscurity’. Explanation: Cryptography can be divided into two types. These are classic cryptography & modern cryptography. Classic cryptography deals with traditional characters, i.e., letters & digits directly. It is based on the concept of ‘security through obscurity’. 14. ________________ cryptography is based on publicly known mathematically designed algorithms to encrypt the information. Explanation: There are 2 types of cryptography – classic cryptography & modern cryptography. Modern cryptography operates on binary-bit series and strings. It is based on publicly known mathematically designed algorithms to encrypt the information. 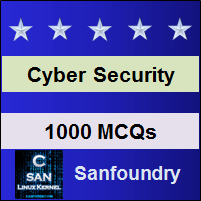 Sanfoundry Global Education & Learning Series – Cyber Security. To practice all areas of Cyber Security, here is complete set of 1000+ Multiple Choice Questions and Answers.